I've just realised it's been just over two years since I started looking at the ARIA charts from decades past - so before we kick off this week's journey back to 1989, I wanted to say a quick thank you to anyone who's read this blog. Keep the comments and messages coming! Back to 1989, and unlike most weeks when I can make some general observation about the new entries or focus on a specific trend happening at the time, there's nothing obvious to say - other than that the three debuts hinted at the diversity that was to come to the ARIA top 50 in the '90s. Rap, pop, rock... something for everyone. Still at number 1 this week in 1989 was "The Look" by Roxette, spending a third week at the summit. In fact, the entire top 8 was pretty static, with only a swapping of places at numbers 3 and 4 from the previous week. "Young Years", the first single proper from Dragon's Bondi Road album, had returned the Australasian band to the top 20, but this follow-up didn't fare anywhere near as well. I can see why - although I don't remember it from the time at all, it sounds more like something Air Supply would've released a decade earlier than a single by the band behind "Young Years", "Cry" and "Dreams Of Ordinary Men", to name just a few of Dragon's great '80s singles. The second of three singles highlighted by BMG Records was the latest by the revived Sunnyboys. The band's previous single, "Too Young To Despair", had only managed a top 80 placement despite being featured as Single Of The Week twice (here and here) - and "Sinful Me" couldn't even crack the top 100. I don't even know what the song sounds like, since I never heard it at the time and it's not on YouTube or iTunes, so we'll all have to use our imaginations. As for the third Single Of The Week? We'll be seeing that pop up as a breaker in the near future. Making their debut this week in 1989 were a Scottish band whose name was apparently inspired by the film Paris, Texas - and the guitar intro of this debut single does seem influenced by the movie's famous Ry Cooder soundtrack. 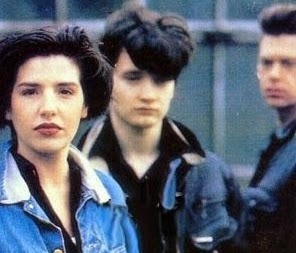 Fronted by Sharleen Spiteri, Texas got off to a flying start with "I Don't Want A Lover", but as we'll see in months to come, subsequent singles struggled to make the same kind of impact. Indeed, it would be a long eight-year wait and somewhat of a shift in musical direction until Texas would enjoy a hit single anywhere near as big. Everything was bigger and better for Tone Lōc's second outing, "Funky Cold Medina". Not only did the track outdo "Wild Thing" by reaching the ARIA top 10, but it contained more samples (including "All Right Now", "Honky Tonk Women" and "You Ain't Seen Nothin' Yet") and had a more expensive looking video (OK, that wasn't hard). Once again featuring quote-worthy lyrics by Young MC (this time with a couple of co-writers), the track about a Rohypnol-type substance was also Tone's second in a row to sell a million copies in the US. Things were looking pretty bright for the gravelly voiced rapper's future... but we'll see what happened in a couple of months when the third single from Lōced After Dark was released. Her remake of "Ring My Bell" was still in the top 30 after 17 weeks and it was joined on the chart by this abomination. If you've checked out any of my personal charts on this blog, you'll know I like cheesy pop as much as the next person, but "All I Wanna Do Is Dance" is just awful. From its lame attempt at acid house-style production ("let's use trumpets!") to its terrible melody and Collette's thin vocals, it's further proof that Australia really hadn't got a handle on dance music yet. Then there's the video - more lycra than a Supré commercial, the cheapest looking set this side of Ramsay Street, some woeful choreography and that same backing dancer from the "Ring My Bell" clip (did he give them a 2-for-1 offer?). If only Collette had been a one-hit wonder, we'd have been spared this. Next week: we'll have three very different cover versions to recap, and yet another environmentally friendly single hits the top 50. Brother Beyond's 'He Ain't No Competition' becomes the first Breaker this year to spend 4 weeks in the Breakers section (yes, I've been keeping count) without eventually cracking the top 50. Quite a large difference between AMR and ARIA this week, presumably, with Wa Wa Nee's 'I Want You' spending its final week on the AMR top 100 at #96, but sitting just outside the top 50 (and bouncing back significantly) on the ARIA chart. I wonder what caused it to re-emerge? It was available as a video single, I believe (though presumably this was available at the same time as the vinyl/cassingle/CD? release) - I wonder if either chart counted the video's sales towards its chart position? 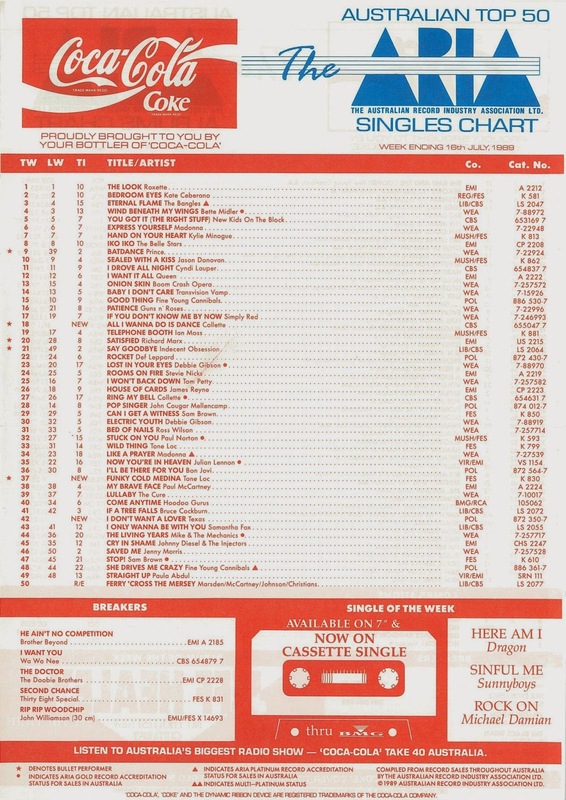 I must've picked up this chart, as I remember Dragon appearing as single of the week with 'Here Am I'; a song I don't think I ever actually heard until now. Actually, I looked at the wrong week of the AMR chart. 'I Want You' was out of the AMR top 100 this week! What can I say, I absolutely love 'Texas'. They had huge success in UK/Europe in the late 90's and early '00's. I really got into them in '99 after watching many appearances by them on TOTP, which was great to watch on UKTV on Foxtel and kept me in the loop of what was happening in the UK and discovered a lot more songs that just were misses here. When they released their Greatest Hits album here retitled as 'Songbook' due to the lack of hits here, I wasn't happy, so I ordered the UK Greatest Hits. LoL. Just a few weeks ago, I discovered in my CD collection a CD single of Dragon's 'Young Years'! I must have bought it second hand, cause I didn't buy my first CD single until 1992 and it was Bryan Adams 'Thought I'd Died And Gone To Heaven'. BTW, I hated BA and that 'Waking Up The Neighbours' LP, but this single blew me away. Anyway, I'm stoked that I have 'Young Years' on CD. So when did CD singles come onboard? I wonder if this CD single is rare as? I first saw CD singles (all 3" CD singles at that point) in stores in late 1989. Stuff like Eurythmics' 'Don't Ask Me Why' and Alice Cooper's 'Poison'. The music section of my then-local Target (do they still have music sections?) had a bunch of them, which I don't think anyone ever bought. The $9.99 price-tag (from memory) surely wouldn't have helped matters. The UK definitely had CD singles as early as 1987, though not every single was available in that format yet. I recall a reader's poll in UK pop mag Number One in early 1990, asking readers what format/s they bought albums and singles in. Only 1% of readers bought CD singles according to the published results, though it was a magazine aimed at teens, who may not have had (or been willing to spend) the extra money to buy the CD format. If I remember correctly, one of the ARIA top 50 charts from 1987 had an ad for Shona Laing's 'single of the week' ('Drive...' something I think), which was available on CD single for $9.99 (the price was listed in the ad). I don't think CD singles really took off here though until the second half of 1991 - at least, that was when my local record stores started stocking them in larger quantities. The price coming down to $6.99 or $7.99 no doubt helped as well. I also loathed Bryan Adams at the time, but 'Thought I'd Died...' wasn't bad at all for him. I've grown to at least tolerate his other singles from that period, except 'Have You Ever Really Loved a Woman'. I bought my first CD single in December 1992 - Shakespears Sister's 'Hello (Turn Your Radio On)'. I think it was $8.99 in Brashs (who were always a little dearer). Ah yes, I just checked, and the Shona Laing ad appeared on the 23rd August 1987 ARIA chart, with $9.99 listed as the price. $22.27 in 2013 dollars (the latest year available) according to the RBA Inflation Calculator website! "Available on 7", 12" and CD single" - no mention of a cassingle, curiously. Michael, the Dragon CD single has an entry on discogs.com - http://www.discogs.com/Dragon-Young-Years/release/2277286 . Two people have listed they have it, though none are currently for sale. Was it a 3" or 5" CD? I've got a still-sealed Oz 3" CD single for Gyan's 'It's Alright' which I bought on eBay in about 2004. Brashs were always that little bit more expensive! I used to shop elsewhere if I could help it - but then ended up working there as a casual in the mid-90s, a couple of years before they went bust. I never did a stint in a record store. I would have found it interesting to see what people were buying. Wow, the music industry really ripped us off in the 80's...and 90's. Re Shona Laing's 'Drive Baby Drive' that should have been a hit (even though it ended up on the compilation 'Hit City 1987'), does anyone know if it charted in the Top 100 and what position it got to? I must correct myself, after thinking about it a lot more, the first CD single I bought was INXS 'Shining Star'. It was mainly because it was a studio single lifted off the 'Live Baby Live' album and after Molly's poor review of LBL, I decided to just get the single. So yeah, it would have been around November 1991 I purchased it. Can't remember how much I paid, but it came in a thick plastic case, like album CD's, rather than the slim CD single cases. 'Thought I'd Died And Gone To Heaven' would have definitely been the second purchase though. I often bought CD singles if they had other previous singles on it. I hated singles that had the radio edit and then the rest being remixes of the song. Mabye I just wanted to get my money's worth. Nathan, the 'Young Years' single is 5". What are 3" singles? Were they like those really limited miniature discs that appeared in the early to mid 90's and mainly album offerings? I recall Lionel Richie's 'Back To Front' album being popular on this format. Drive Baby Drive got to number 65. Shona's hit, "(Glad I'm) Not A Kennedy" was on the very first chart I recapped on this blog - and is still one of least favourite songs from 1987. I liked '(Glad I'm) Not...' at the time. It was one of the earliest songs I downloaded, once I knew how. I still like it, but it wasn't quite as good as I'd remembered... it sounds like it was played on a cheap keyboard from K-Mart. Michael, I think you're thinking of DCC's (digital compact cassettes). No, 3" CD's were just tiny CD's that fit about 20 minutes' worth of music on them. You can see a pictures of one here - http://www.discogs.com/viewimages?release=55512 - though that would be quite a bit larger than their actual size. This was the first 3" CD single I bought. Most of them came in card wallet sleeves, though I've got a couple that were housed in 5" slimline CD cases. I do remember the digital compact cassettes and the 3"CD's after checking out your picture. 'Back To Front' must have been on DCC. I'm just trying to think of a single that I saw on 3" CD in its day? Maybe I do have one lying around home somewhere? If not DCC, maybe it was mini disc? Though I'm not sure if they were around then, as I never bought one.